Philadelphia 76ers guard Markelle Fultz works on his jumper before a recent game against the Toronto Raptors at Wells Fargo Center. On a blustery winter night in the middle of January, Markelle Fultz is working. Sixteen miles from Philadelphia’s gorgeous, state-of-the-art practice facility in Camden, the No. 1 overall pick is in a high school gym, putting in extra work away from the team. He is in sweatpants and flanked by a couple confidants, one of whom holds three different sized balls for Fultz to use while going through various shooting motions. There is something about this scene that an average bystander would not comprehend: The Sixers have no knowledge this workout is taking place, or that one of the men involved in the intimate session was working with Fultz when his shot went off the rails in the first place. This story, perhaps more than any other, is representative of the tornado of voices around Fultz, internally and externally, all thinking they know how to fix what ails the only top basketball prospect who ever forgot how to shoot. Over the course of the last six months, PhillyVoice has spoken to people in, around, and connected to the Sixers about what is going on with the kid who was supposed to be the final piece of their puzzle. What is most striking is the degree to which opinions on Fultz’s shot diverge depending on who it is you ask. Doctors explain how unprecedented this is for a basketball player, staffers point the finger at outside influences, and his own GM says publicly his range does not currently extend beyond the paint. All the while our subject in question remains silent, retweeting videos of what his shot used to look like as an avalanche of criticism floods his Twitter mentions. Markelle Fultz is surrounded by sound and fury. And once you begin to understand that, the disappearance of his jumper makes a lot more sense. The man in that New Jersey gym with Fultz is someone who spent the majority of Fultz’s life working with the young guard. Keith Williams is not just a trainer, he is effectively an extension of Fultz’s family. Williams, who grew up with Fultz’s mom in Temple Hills, MD, has been working with Fultz in some capacity since the guard was just seven years old. He was an integral part of his rise from JV player in his sophomore year at DeMatha Catholic to the No. 1 recruit in the country and has earned that spot in his inner circle. It was Williams, not a professional management team or agent, who later helped secure endorsement deals for Fultz with the likes of Nike, JBL and Samsung. The base of trust between them has been built over a decade-plus. Perhaps that undying trust is part of the problem. When Fultz left the Sixers following Summer League in July, there was no reason to expect his shooting ability would disappear between his final appearance in Las Vegas and the first day of training camp in late September. Privately, the Sixers have insisted they had no interest in changing any mechanics, pointing to the success he had with his jumper at Washington. His mechanics weren’t perfect — a team source said they would have graded them about an 8.5 out of 10 — but that they were more than good enough given his track record of success from distance. But during that month-and-a-half hiatus, Fultz continued to work on his game in solitude with the help of his trusted trainer. When he returned to the public eye in late September, it was clear something had gone wrong. Pressed by reporters on Fultz’s wacky free-throw form on September 28, Sixers coach Brett Brown was open and honest about what was going on. There are two important threads here. One, in their first public discussion of the situation, the Sixers openly admitted to a change in mechanics. Second, and perhaps most importantly, they framed it as though a plan of action could be put in motion to restore what the shot once looked like, all without mentioning a health issue. As a point of fact, it was Williams who Fultz worked with in August and early September. But what happened during that time period all depends on who you believe, because no one has been able (or at least willing) to offer a concrete answer. Discussions with Sixers officials have been inconclusive. The core of what they have to offer is incredulous, claiming they don’t have any idea when the problem started. They continue to point to Fultz’s shoulder soreness as the primary issue, though Colangelo’s October claim that they don’t know which came first — the soreness or the mechanical switch — leaves a lot to be desired. In this instance, they have plausible deniability on their side. However, the suggestion they don’t know if or when Fultz made a shot change, or whether it preceded the shoulder soreness that has been leaned on as an excuse, is concerning either way. When you invest as much as the Sixers did to acquire Fultz, “We don’t know” is a baffling summary of events. Williams was much closer to the situation, though he maintains a similar stance. During a public appearance on Sportsradio 94 WIP in October, Williams suggested it was preposterous that someone with Fultz’s track record could even think about changing his mechanics. Williams was not exaggerating when he said this. Fultz was viewed as the near-consensus No. 1 prospect in basketball prior to the 2017 NBA Draft, primarily for his shooting. While playing at the University of Washington, Fultz made 41.3 percent of his three-point attempts on exactly five attempts per game. ESPN's Mike Schmitz, a highly-respected scout who previously covered the NBA Draft for Draft Express, called Fultz, "a franchise lead guard, future All-Star, and a player any organization can build around" in a write-up posted the day of last June's draft. What was most striking about his shooting was not necessarily the percentage, but instead, the variety of shots Fultz was capable of making. He was liable to pull up from anywhere on the court, hitting shots from all angles with hands in his face. PhillyVoice reached out to Williams several times in late January, in the hopes he would elaborate on his claims or offer an explanation of his own. After initially agreeing to speak about the situation, he declined to comment for this story, citing an unwillingness to rock the boat as the saga unfolds out of respect for his protege. Comment or not, the evidence suggests someone is not being truthful here. Members of the organization expressed their frustration with Williams over the course of the last six months, viewing him as at least a portion of the problem. On the flipside, there are people close to Fultz who point the finger in the other direction. They see a kid who never had an issue with his jumper and was drafted No. 1 overall predominantly because of his shot. Even if someone outside the Sixers sent him down the wrong path last summer, they see it as the team's responsibility to get him right now, something the Sixers have failed to do over the last couple months since clearing him December 9. There is a level of sensitivity in how the team collectively talks about Williams, knowing the closeness of his relationship with Fultz. In the midst of a trying saga, the last thing the franchise wants or needs is to alienate a player they’re in the process of trying to get right. That doesn’t mean everything is peachy. Presented with the information Fultz had been spotted in the gym with Williams as recently as mid-January, there was a bit of a shocking development: I, along with several other members of the media, had learned of the workout session(s) before the team did. The replies I received did not explicitly condemn what happened — and those I talked to described it as a one-off meeting, rather than habitual work — though they say a lot in what they do not say. The real twists in Fultz’s story started in October, when his agent, Raymond Brothers, went to ESPN’s Adrian Wojnarowski with a claim his client had to have fluid removed from his shoulder. It set off alarm bells around the NBA and for a public that has an open distrust of Philadelphia’s medical staff. Within hours, the story was corrected, as sources indicate Bryan Colangelo spoke via telephone with Brothers to clear the air. Fultz had received an injection of cortisone in the problematic shoulder – a much more normal task for someone dealing with soreness than removing fluid. Wojnarowski’s story was corrected with a more factual anecdote from Brothers, though the story had created enough noise that Colangelo would go on to speak to the media about Fultz anyway. In the middle of all this, with an agent claiming Fultz couldn’t lift his shoulder and a GM announcing Fultz was out of the lineup so they could, “take a step back, let him take him take a breath and get him healthy,” the player in question continued to work. Multiple sources familiar with Fultz’s regiment insisted he continued to shoot jumpers in private, even on the exact same day the report from Wojnarowski hit the internet. Four days later, the Sixers would rule him out indefinitely following a visit with Dr. Ben Kibler, Medical Director of the Shoulder Center in Lexington, Kentucky. They did not hide him altogether in the meantime. On Nov. 6, Fultz made an appearance in front of the media at the practice facility, and every jump shot he put up was with his non-dominant hand. While that became the immediate story, there was something more important you could see while Fultz was working out in our view: he did not shy away from using the shoulder the team used to rule him out indefinitely. This video, from that November 6 practice, shows Fultz being comfortable enough to toss up righty layups at the rim. This in itself is no huge deal; shoulder injuries and pain are often linked to a range of motion rather than blunt force, and underhand tosses do not involve the scapular muscle the team has blamed for his issues. But to illustrate the Zapruder-esque territory we are in with Fultz, there is another blurry video from that Nov. 6 practice of Fultz using a goofy overhead toss as he’s going through drills, in a manner that can’t be helpful for what was being framed as an aching shoulder. After some public confusion over the left-handed jumpers witnessed during that session, the Sixers took him out of the public eye for a while. But Fultz continued to shoot jumpers in closed settings as an official diagnosis came in: scapular muscle imbalance. Philadelphia 76ers guard Markelle Fultz was examined and evaluated today by Dr. Ben Kibler, Medical Director of the Shoulder Center of Kentucky at the Lexington Clinic, for the soreness and scapular muscle imbalance that he has been experiencing in his right shoulder. The soreness is dissipating and the muscle balance is improving, and Fultz will continue with physiotherapy and begin progressing toward full basketball activities. Fultz will be re-evaluated in approximately two to three weeks. His return to gameplay will be determined by how the shoulder responds to progressive basketball training and practices in the interim. In some respects, there was nothing “progressive” about what Fultz was doing during that time period. Multiple people who spoke to PhillyVoice insist Fultz never stopped shooting, with Fultz getting shots up throughout the months of November and December. He may not have been on public display the entire time, but he was in the gym all the same. The reasoning for this depends on who you ask. From the outside, many have looked at Fultz as a kid afraid to deal with the scrutiny, hiding during those fall months to escape the glare of the camera. Internally, Sixers staffers insist this was the team's call first and foremost, and that Fultz has never requested to hide from the public. Even if we were to accept Philadelphia’s word as communicated through their press releases — that Fultz was not free of shoulder pain until early December — there is still reason to doubt the extent to which health issues impacted his play in the first place. Publicly, we were all aware of a change in Fultz’s free-throw form and the jumper by late September. Conveniently, the Sixers happened to play their first preseason game on Oct. 4, a home game against the Memphis Grizzlies. If Fultz was nursing shoulder pain to a degree that it impacted his shot and the ability to make overhead motions, he did not show it much while cocking back to dunk toward the end of that first Sixers loss in the preseason. Shoulder injuries can be complicated, and one range of motion that looks more forceful can end up being less stressful. The ability to hammer a dunk home does not necessarily mean shooting will be completely comfortable. There is a problem in applying this logic to Fultz. The No. 1 pick played in another preseason game in Boston shortly after the Memphis game, and we saw the beginning of a pattern that has remained consistent in the months since. On a mid-range pull-up, Fultz rose up and shot the ball naturally, undeterred by any issue he may or may not have been dealing with. All these months later, we have seen Fultz show a similar level of comfort in his mid-range pull up. In the first public access we had to him in months, Fultz played a rotating one-on-one game with Jacob Pullen and James Michael McAdoo, since departed from the Sixers. The best shot we saw in the bunch came from around the free-throw line, as he rose up and looked like the Fultz of old. The problems have come everywhere else, or in more direct terms, in all the areas of the court Fultz struggled or refused to shoot from last we saw him play in a real game. His three-point shot looks more like a shot-put than the smooth stroke we saw when he was at the University of Washington, and that horrible form has been the subject of great debate. Even when Fultz is going through basic shot-building reps near the basket, he looks as though he has to will himself through the process of getting the ball up toward the hoop. This video, for example, was taken before a game on Feb. 2 and includes an airball from just several feet away. Other Sixers, including Dario Saric, go through similar drills prior to each game, and none look anything like this. What the Sixers are trying to sell is this story: Markelle Fultz has the same problems with his shot in January that he had in October, without the same health problems they claim he was dealing with during that time. What the public is asked to believe is that this scapular muscle imbalance — a problem which required no formal procedure to address — is the only shoulder issue in NBA history to drain the ability and desire to shoot from a prominent NBA player. You are supposed to think that a professional athlete who was out on the court and exercising at the same time he was “out indefinitely” is capable of losing enough strength and muscle memory between late October and early December that he would still be unable or unwilling to shoot a three in mid-February. Who better to ask about a scapula injury than the very doctor who diagnosed Fultz to begin with? The shoulder is a more complicated entity than many would expect if you take Kibler at his word. 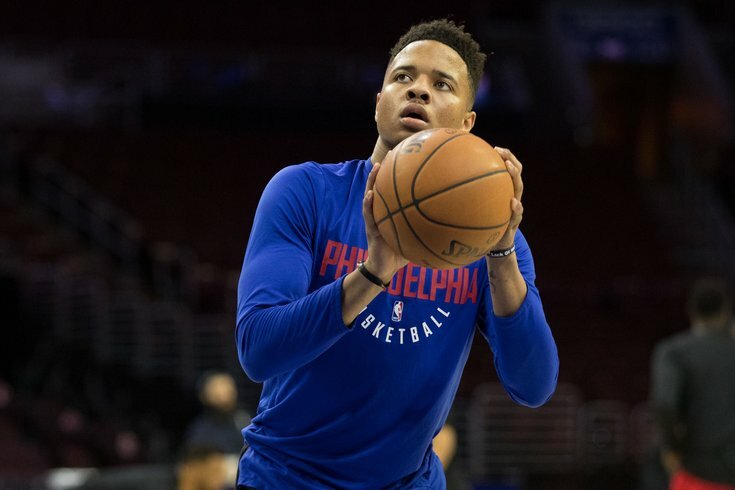 Kibler, who examined Fultz in the fall and has seen him semi-frequently since, explains there are several muscles in the shoulder blade region that are prone to just shutting down altogether to prevent further damage, which upsets the machinations of the different muscles working together to shoot a jumper. For a right-handed shooter, Kibler says a shoulder blade issue will often cause a player to miss free-throws either short or to the right, due to a lateral tilt caused by the ailment. If you look at some of the struggles from Fultz in recent weeks, there is some merit to this claim backed up by video evidence. Kibler describes a process made up of three components on the road to recovery: strength, endurance, and power. While strength can be recovered relatively easily, endurance and power take longer, and the latter is almost always the first to drop out. Watch Fultz look comfortable in the mid-range and much less so from the three-point line, and you can see how that might apply. Yet even Kibler, one of the top experts in the world when it comes to the scapula muscle, is working from an information deficit. Medical experts have a surplus of knowledge on how this injury comes about in tennis players and pitchers because mechanics have been obsessed over through study of high-speed cameras and biometrics. The same can not be said of a shooting motion in basketball. And because it’s a muscle injury, Kibler says, recovery patterns range widely from one person to the next, so the constantly shifting timeline for Fultz shouldn’t come as a surprise. You sense fascination and a dull sort of excitement from Kibler, who sees the Fultz case as a reason for people like him to study the scapula more intently in basketball. The Sixers’ practice facility, he tells me, is equipped in a way that the medical community can use to study biomechanics and repeatable motions in shooters. There may not be a magic solution for Fultz, but tracking his progress helps expand the broader knowledge base. But while paths back from injury are not linear, they usually are at least logical. A player who returns from an ACL tear, for example, might show some hesitation to plant and explode off that leg too hard early on. They may even lose a few inches on their vertical leap. What they don’t do is forget or fear how to jump altogether. If they did, how far would a team be willing to go to help that player learn again? The Sixers, according to multiple people who spoke with PhillyVoice for this story, believe they are one of a small group of NBA teams with a setup that allows them to train players in virtual reality. It is something the organization has been toying with over the last half year or so, which they believe is primarily useful to help put players inside a game situation, like being part of an inbounds play. It is a way to keep them involved in the program when they can’t participate physically, as they've done with injured rookie Furkan Korkmaz. With Fultz, there is a different motivation to get him behind the VR goggles. The Sixers, according to multiple sources, wanted him to be able to visualize the mechanics he’ll use in a game, to remember how easy it once was for him to rise up with the ball and shoot from anywhere on the court, and to be able to do so without the glare of the cameras or other people around him. With pressure coming down on him from all angles, turning part of a teenager’s job into a video game is one way to relieve the stress of the situation. This game away from the game is consistent with their broader approach. Philadelphia’s brain trust has done their best to shield and uplift Fultz in any way it can, whether from public opinion or from an overdose of voices in the Sixers' own building. They have no shortage of coaches, trainers, and scouts with opinions on how the rookie should rediscover himself, but team representatives insist Fultz’s team instruction comes exclusively through Brett Brown and assistant Billy Lange, the latter of whom is constantly seen running Fultz through drills. When they do not have the time to give Fultz their full attention, former NBA player Mahmoud Abdul-Rauf has been called upon to lead Fultz in extra sessions. Abdul-Rauf, who was sought out by Fultz’s agent and his family initially, was given the team’s blessing to help get their No. 1 pick back on track, according to a source. When the Sixers’ coaches have to focus on more present-day issues — game-planning, film study and the like — they are happy to have someone who can continue to push Fultz on the court. This has extended to the players who are suiting up for Philadelphia. JJ Redick, one of the greatest three-point shooters in the history of the league, has been spotted giving Fultz some light instruction at the practice facility while mimicking shooting motions at the young protege. Not so coincidentally, Fultz’s locker at the Wells Fargo Center has been strategically placed next to Redick’s. The team has tried to downplay this back-and-forth as something normal that any teammate would do for a buddy in need, but there is a level of guidance from the powers that be which is obvious. The Sixers have not shot down attempts from Fultz to bring in outside help to help guide him toward a return, and if anything they have encouraged him to do extra work. Their investment in Fultz is significant on every level, from the draft capital they sacrificed to get him to the blood, sweat, and tears they have poured into helping him find a solution. This makes Williams’ winter appearance — under cloak and dagger, no less — that much more confusing. Were it not so sad to see what Fultz is going through in the public eye, you would almost have to laugh at the situation's absurdity. As millions of people watch Fultz struggle to rediscover old muscle memory and patterns, the people invested in his success find out third-hand he is retreating away from the lights, all to work with the old partner who influenced the mechanics to begin with, for better and possibly for worse. The only person I could not speak to in the process of asking, “What’s wrong with Markelle?” was Markelle himself. You are forced to trust the anecdotes of his teammates, his confidants, the personnel around his organization, and the coaches working to get him back in fighting shape. A teenager’s life and career are on public trial, and all he has been allowed to do is trot right back onto the court at the practice facility, his work fodder for more public debate. Those close to him insist that shouldn’t surprise anyone. Even as the causes are debated and organizational politics come into play, not a single soul close to the kid has a negative thing to say about him. To a man, they rave about his dedication to get this thing right and have the career he has always dreamed of. The silence is just how Fultz operates. One of the major questions asked lately has been why the Sixers haven't protected Fultz more by keeping him behind closed doors, letting him figure things out on his own time. To a degree, they did that earlier in the year and only submitted press releases on him "ramping up" because they were encouraged by his progress away from the cameras. At several points throughout December and January, separate team sources expressed a belief he would be on the court sooner than later, playing at a level not far from what we saw out of Fultz in college and summer league. This was obviously a miscalculation. His reemergence in front of the public is also partially a product of his own desire to be out there and carrying on like normal, according to sources who spoke with PhillyVoice. Just as Joel Embiid has some autonomy in whether he suits up for a game, Fultz holds a lot of power in how his situation is handled. He does not want to be known as the kid who backed down from the challenge, knowing he has already overcome plenty to get here at all. The Sixers have currently chosen to empower that, rather than letting a teenager become consumed by inner demons away from the spotlight. You would still be forgiven for having your doubts about the way forward. With this much power, Fultz ultimately has final say in his return to action, and team officials have half-expected him to walk in one day and just declare himself ready to go. This is an alternate explanation for the fluid timeline that doesn’t involve injury — the Sixers can’t say when he’s coming back because it is impossible to know. In the first major media appearance he made in months, Fultz went on national television on Feb. 6 and copped to having to “relearn” some basic physical functions of being a basketball player. This is a different tone than he struck in late September, when he claimed he just, “wanted to try something new” with his free throws and that most of his work was focused on preparing for a deeper three-point line. Fultz has yet to prove he can use the same shot mechanics on Wednesday that he did on Tuesday, let alone if he can recapture the same mechanics we saw at Washington. The video log piles up day after day, and what looks smooth one day is janky the next. His own GM said in a public presser on Feb. 9 that his range does not extend beyond the paint, and while speaking with Brett Brown before a game on Feb. 10, his head coach compared the shot-rebuilding process to what he went through with Nerlens Noel, a center who was not known for his touch at any level of basketball. My routine with Markelle is similar to what I did with Nerlens. And there was a stage with Nerlens where I didn't let his guide hand come to the ball until after Christmas. I'm serious. Everything was shadow hand or one hand, you'd set the table, you'd set the diamond, we just talked about release points and basic fundamentals that I would do with my 13-year-old son. At this stage, I read some of Bryan's comments about Markelle, and it's true. He's really lately sort of been confined from our eyes from a growth perspective to the paint. So I don't take him out of that. I'm just living at home plate, we're going back to ground zero, and just going through slow, progressive, fundamental stuff. His coach believes in him and highlights how happy he is to help him "reclaim his shot" whenever you ask him about it, dubious as it all sounds. Fultz still has believers in his circle, and they insist the off-court and work-ethic concerns that have derailed careers for other high draftees do not exist here. This is the only consistency in the voices around Fultz. Look at how his teammates laugh with him and defend him, and the bond is clear. There is still a baseline of optimism in the kid himself, whether out of loyalty, investment in his future, or a disbelief this could all end with him never getting right. To come this far and flop so miserably would perhaps be crueler than never making it in the first place; he has tasted his dream and watched it turn into a nightmare. In that sense, the existence of a mental hurdle is beyond debate. A teenager has felt the key to his success slip from his grasp for various reasons, some of which his people will share and some of which they'll never reveal. It is a scenario that would plant seeds of doubt in the strongest-willed adults, let alone a 19-year old trying to establish his footing at the professional level. Perhaps, in the search for answers, the wrong questions are being asked. There is an important detail that was glossed over in Fultz's interview with Caron Butler on Feb. 6, the first media availability for the teenager in months. For the first time, and from the mouth of a man who shares the same agent as Fultz, his diagnosis was described with a different term than we'd heard from the team: scapular dyskinesis. Some reports have (incorrectly) claimed or assumed this is the same thing as an imbalance. This is not the case, and in fact, a muscular imbalance can be a causative factor in dyskinesis. The Sixers already claimed the imbalance was fixed in early December, and sources who spoke to PhillyVoice confirmed the dyskinesis diagnosis Butler used as correct. We continue to see a problem that comes and goes in his shot, changing based on his distance from the hoop and whether he's static or on the move. Dyskinesis remains, which is a small but critical detail in tying the various causes of his missing shot together. When it comes to what those around him say, Hanlon’s razor is the simplest explanation: never assign malice to what can instead be explained by stupidity. The conflicting explanations, the double talk from the team, and the contradicting evidence we see in front of our eyes are not the product of a grand conspiracy, but of a series of people flailing in desperation. That is what tends to happen when you offer so many different explanations you are unable to keep your story straight, just as Fultz's current jumper is what happens as one's body and mind fight to settle on a single set of mechanics. No one aside from Fultz himself can say how much pain he was or was not in, or why he’s on the sideline two months after the team claimed he was 100 percent healthy. But eventually, blind faith will not be enough. Eventually, all the noise, all the excuses, all the openly incredulous reactions will not matter. Eventually, there will be no other voices, and there will only be Markelle Fultz, that kid locked inside a New Jersey gym dying to rediscover what brought him here. His teammates may love him, his coaches may respect him, and his inner circle may believe in him. But he will have to shoot, regardless of what anyone around him has to say. Editor's note: At the time of publishing, the Philadelphia 76ers declined to offer an official comment on this story.